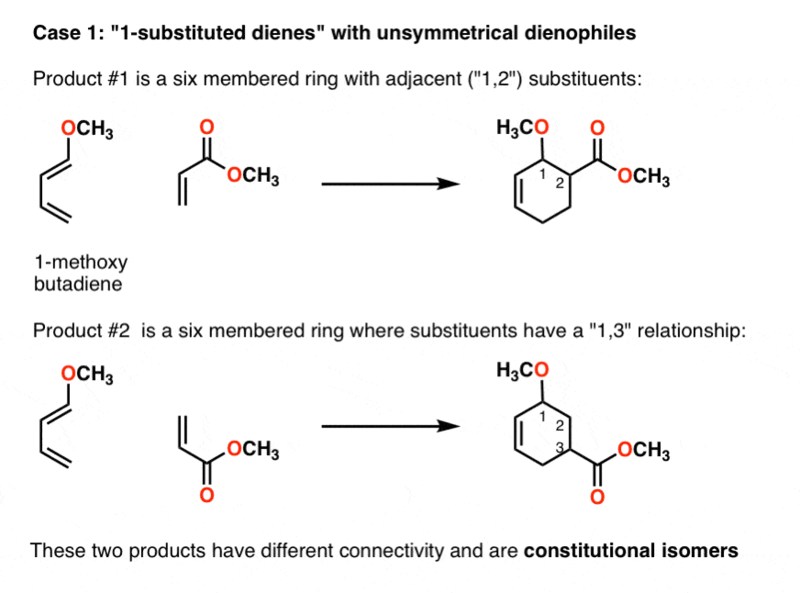 When non-symmetrical dienes react with non-symmetrical dienophiles, two regioisomers are possible. 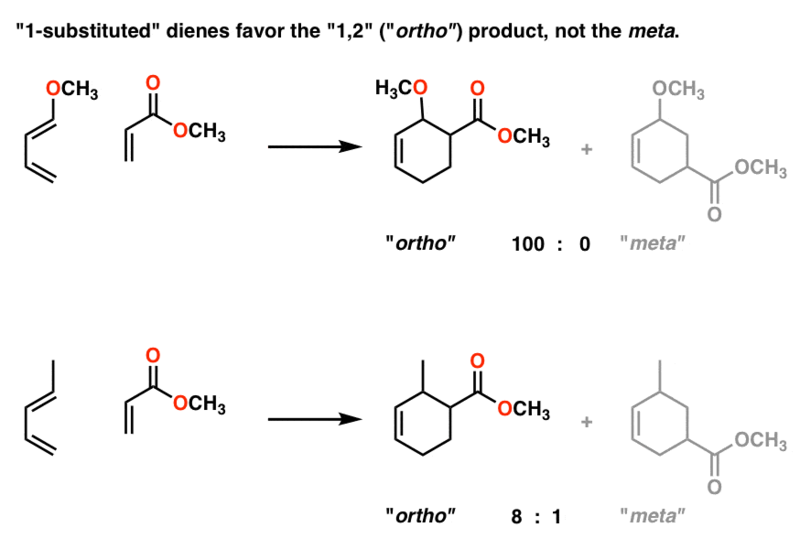 Dienes with substituents on the terminus (“1-substituted dienes”) tend to give “1,2” products (“ortho”). Dienes with substituents on the 2-position (“2-substituted dienes”) tend to give the “1,4” product (“para”). In general, “1,3” products (“meta”) are only minor byproducts. These three situations (laid out in the image below) each have the potential to form stereoisomers (i.e. diastereomers and/or enantiomers). But all the products have exactly the same connectivity. This brings us to a particularly challenging case. 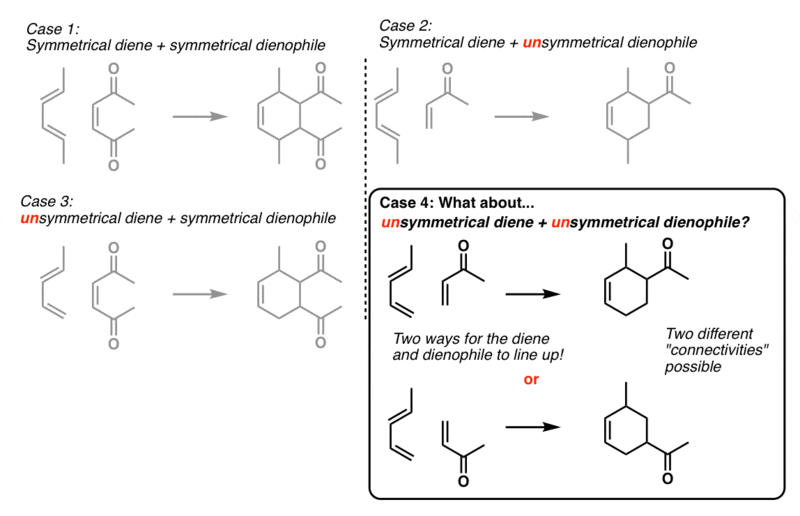 What happens when we have an unsymmetrical diene reacting with an unsymmetrical dienophile? Why is this situation different from the first three? “head to tail” such that they point in the opposite direction (bottom product). How are these products related to each other, overall (not counting stereochemistry)? Since they have the same molecular formula but different connectivity, they’re constitutional isomers. Now comes the big question. In this kind of a Diels-Alder, are these products formed in roughly equal ratios… or is there a preference for one type of connectivity over another? In other words, the reaction has regioselectivity. Where have we seen this type of situation before? These products have the same molecular formula, but different connectivity, which makes them constitutional isomers. However, we saw that the reaction doesn’t give an equal ratio of products. Instead, there’s about a 4:1 preference for 2-chlorobutane over 1-chlorobutane, which we saw was due to a greater preference for the more stable carbocation intermediate. 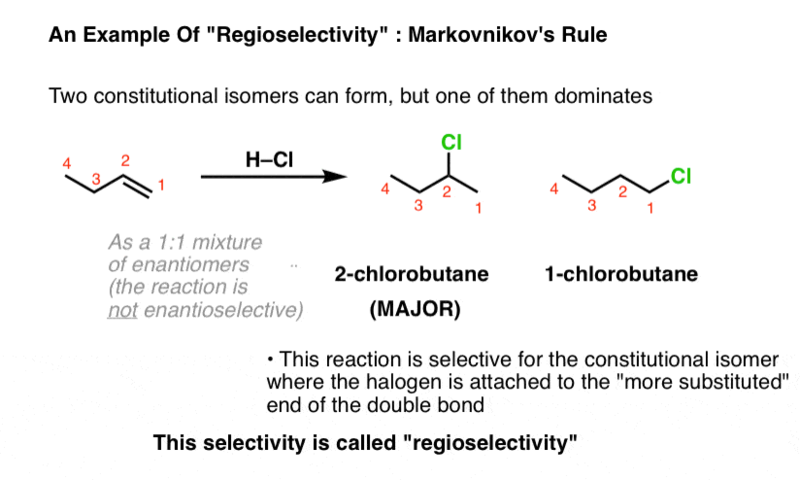 The tendency of alkenes to obey “Markovnikov’s rule” in these reactions is an example of regioselectivity. The reaction is selective in forming one constitutional isomer over another. It’s worth noting that 2-chlorobutane is formed as a racemic mixture of enantiomers. So while the reaction is regioselective, it is not enantioselective. Like the reaction of acids with alkenes, the Diels-Alder reaction is regioselective. Two main cases will illustrate the point. The first important case concerns a diene with a substituent on the “1” position of the diene, such as 1-methoxybutadiene. (I know that if a methyl group were present instead, it would technically be the “4” position according to IUPAC – bear with me on this). Consider the Diels-Alder of 1-methoxy butadiene with methyl methacrylate. 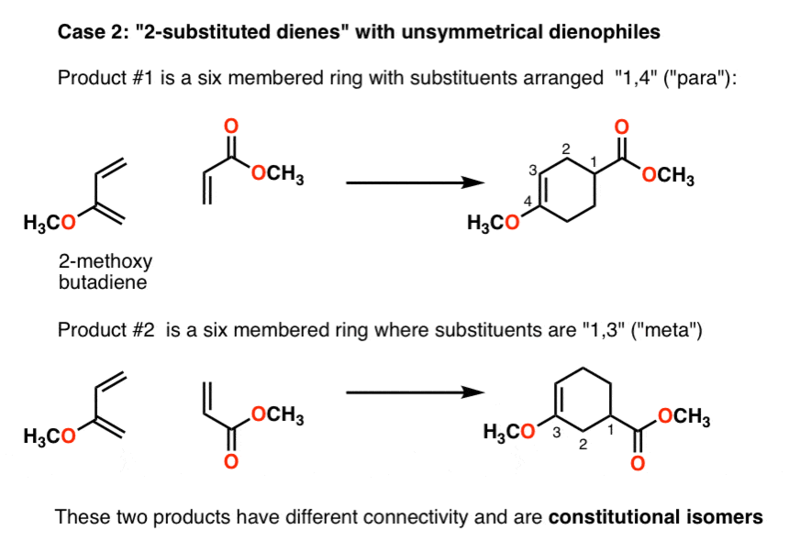 There are two ways that the diene and dienophile can connect. Line it up another way (“head to tail”), and the two substituents have a “1,3” relationship. These two products have different connectivity and are therefore constitutional isomers (“regioisomers”). 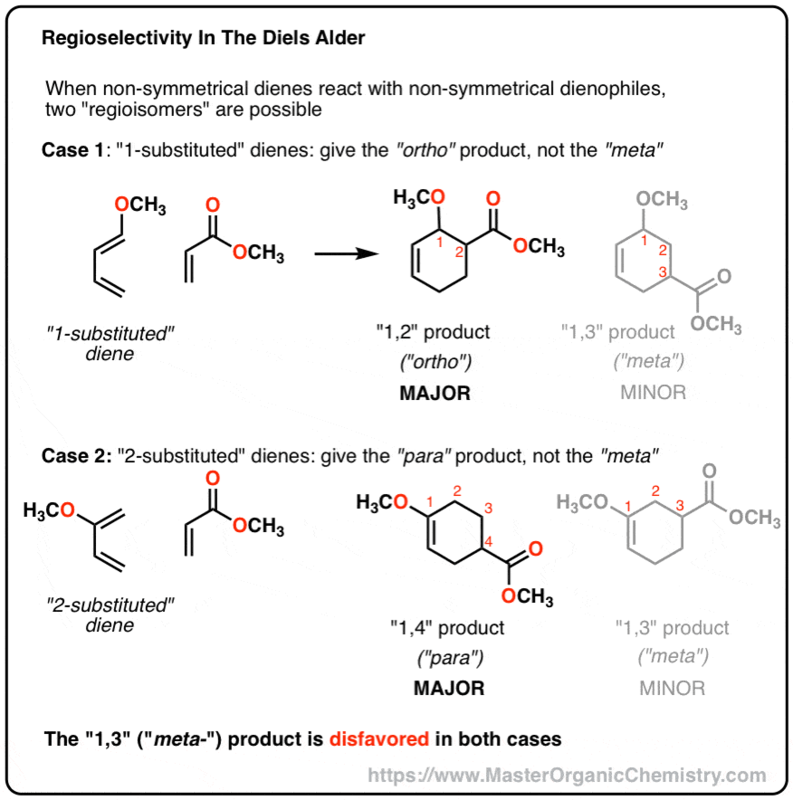 So which of the two Diels-Alder products is favored? The “ortho” or the “meta” ? The ortho product is major and the meta product is minor. This holds for a large number of 1-substituted dienes; I’ll just show two. Hans Reich at UW-Madison has a longer list of examples – see here. With 1-methoxybutadiene, the ortho is the only product!! The second important case is when there’s a substituent on the 2-position of the diene, such as 2-methylbutadiene. 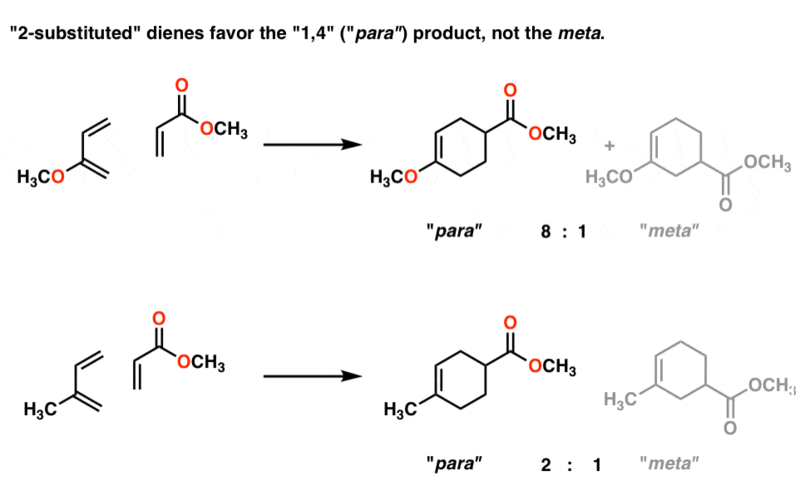 Again, there are two ways it can line up, except this time it’s to provide para (1,4) and meta (1,3) products. So which of these products is dominant? The para product is major and the meta product is minor. Avoid the meta- product. That’s really it. So why does the Diels-Alder wind up this way? For the answer, read on….. 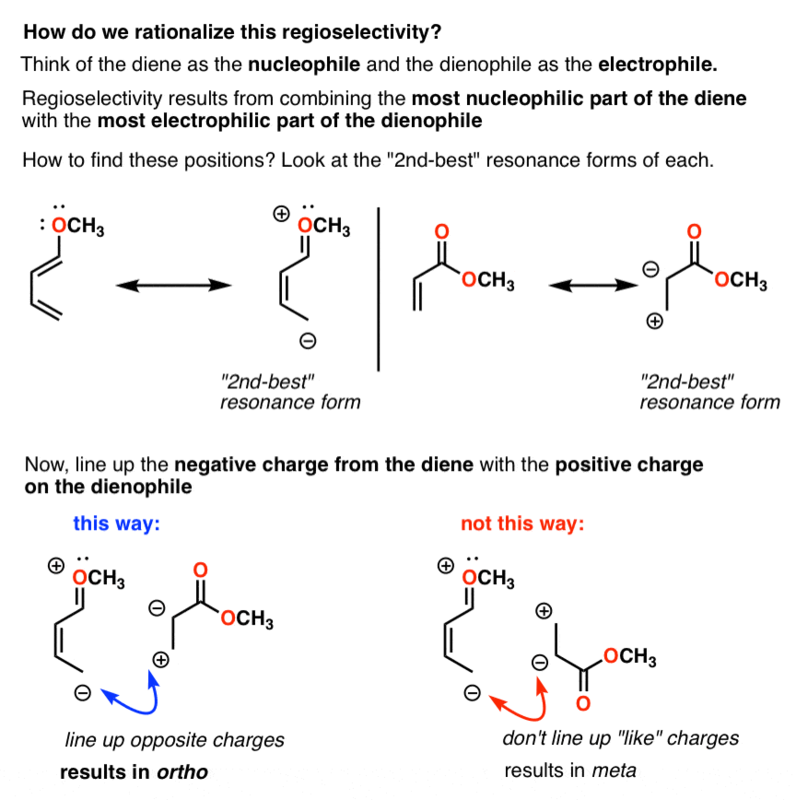 Think of the diene as a nucleophile and the dienophile as the electrophile. The dominant product will be the one where the most nucleophilic carbon on the diene lines up with the most electrophilic carbon on the dienophile. So how do we determine what these carbons are? Line up the negative charge on the diene with the positive charge on the dienophile. This will get you to the right result! Note how this results in the ortho– product and not the meta- product, just like what’s observed in experiment. Note how this correctly predicts the para product will be favored over the meta product. Now… is this really the best way to do it? For more advanced purposes… we rely on molecular orbital calculations. In advanced courses, we talk a lot about the size of “coefficients” on the HOMO or LUMO of the diene/dienophile, and we’re not going there. If you are interested in this topic, I highly recommend Ian Fleming’s Frontier Orbitals and Organic Chemical Reactions. Classic book. What if they’re both substituted? Here’s a practical example. What’s observed is that the 1-position on the diene has a greater influence on the product than the 2-position. Hi, quick question. 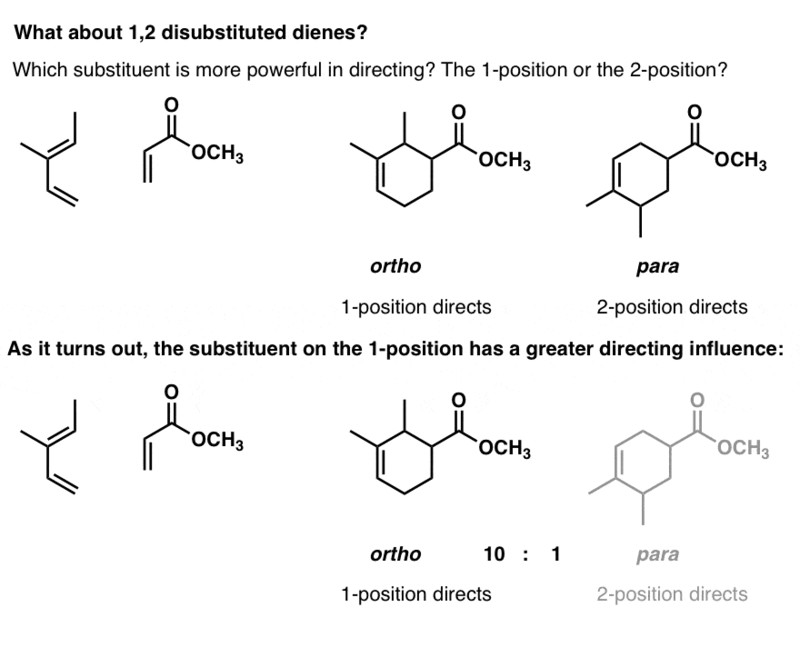 In regards to ‘1-substituted dienes’ and ‘2-substituted dienes’ can electron withdrawing groups vs electron donating groups affect the ‘head:head or head:tail’ alignments and therefore break the given rule that a ‘1-substituted diene’ always gives ortho product? Good question! The result will still be “ortho” and “para” products. 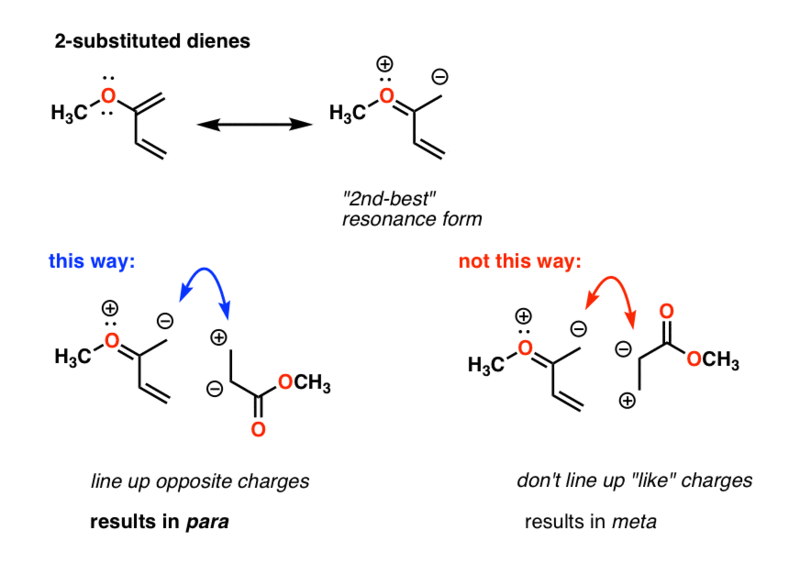 If you start adding electron withdrawing groups to the diene, then it will tend to undergo inverse electron-demand diels alder reactions (i.e reacting with electron rich “dienophiles”). So something like 2-cyanobutadiene will react with ethyl vinyl ether, but still give para, not meta!